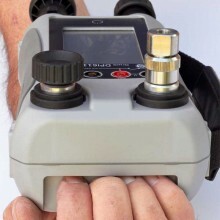 Includes: DPI611 Calibrator, standard AA size batteries, 1/8” NPT & BSP pressure adaptors, set of four test leads, Druck DPI611 Safety and Quick Start Guide & stylus. Building on the technical legacy and more than three decades of experience in pressure measurement and calibration, the Druck DPI 611 pressure calibrator provides all the convenience and reliability of a true “Druck,” yet offers twice the performance in a product half the size. A simple selector lets you convert from vacuum to pressure and with a few stokes of the pump, you will generate the required pressure. State-of-the-art analogue and digital microelectronics contribute both accuracy and processing power to provide a class leading pressure and electrical capability with a unique simple-to-use interface. Taking stability and temperature errors into account over the one year calibration period, the Druck DPI 611 is more than twice as accurate as its predecessor. With the Druck DPI611 you can generate from 95% vacuum to 20 bar/300 psi pneumatic pressure. A simple selector lets you convert from vacuum to pressure and with a few stokes of the pump, you will generate the required pressure. Fine adjustment is made with the built-in volume adjuster and falling calibration points are achieved with the precision vent valve. 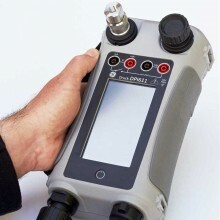 The DPI 611 retains the comprehensive electrical measurement and sourcing capability of the DPI 610 series, but has better accuracy and simplified connections. The display can be configured to show a maximum of three simultaneous reading windows as follows: pressure, electrical measurement or electrical source, IDOS external pressure module. 50% smaller and 33% lighter than the DPI 610. Generates 0 to 20 bar/300 psi in less than 30 seconds. Pressure measurement is twice as accurate. Three times better electrical accuracy. Simplified touch screen interface with application DASHBOARD, quick TASK selection and FAVOURITES storage. Fast, three touch set-up for any application. Calculates PASS/FAIL errors, documents results and interfaces with calibration software. Pressure media: Most gases compatible with aluminium, brass, stainless steel, nitrile and polyurethane seals, PTFE, acetal, nylon. DPI611-07G: for -1 to 2 bar / -14.5 to 30 psi gauge range. Display 110 mm (4.3in) diagonal. 480 x 272 pixels. LCD colour display with touch screen. Internal memory 8 GB (nominal) user memory for automated procedures, calibration data and data log files. Languages English (default), Chinese, Dutch, French, German, Italian, Japanese, Korean, Portuguese, Russian, Spanish. Operating temperature -10° to 50°C (14° to 122°F). 0° to 40°C (32° to 104°F) when powered from optional mains adaptor IO620-PSU. Storage temperature -20° to 70°C (-4° to 158°F). Ingress protection IP 54. Protected against dust and splashing water from any direction. Humidity 0 to 90% RH none condensing. To Def Stan 66-31, 8.6 cat III. Shock / vibration BS EN 61010-1:2010 / MIL-PRF-28800F CLASS 2. Electrical safety BS EN 61010-1:2010. Pressure safety Pressure Equipment Directive - Class: Sound Engineering Practice (SEP). Enclosure materials Polycarbonate, polyamide, polypropylene, acrylic, cotton. Power supply 8 x AA alkaline batteries, Optional mains adaptor P/N IO620-PSU 100 – 260V +/- 10%, 50 / 60Hz AC, Output DC V=5A, 1.6A. Battery life 18 to 26 hours depending on functions. Connectivity USB type A, USB type mini B.
Dimensions 270 x 130 x 120 mm (10.6 x 5.1 x 4.7 in). Weight 1.96 Kg (4.3lbs) including batteries. Druck DPI611 warranty 1 year. Please use the following part numbers when ordering. DPI611-05G for -1 to 1 bar / -14.5 to 15 psi gauge range. DPI611-07G for -1 to 2 bar / -14.5 to 30 psi gauge range. DPI611-10G for -1 to 7 bar / -14.5 to 100 psi gauge range. DPI611-11G for -1 to 10 bar / -14.5 to 150 psi gauge range. DPI611-13G for -1 to 20 bar / -14.5 to 300 psi gauge range. 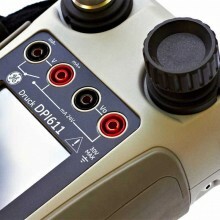 PDF Specifications of the Druck DPI611 Hand-held Pressure Calibrator.